Sorry, Star Lake Resort is closed this winter. We will re-open for guests in June 2019. 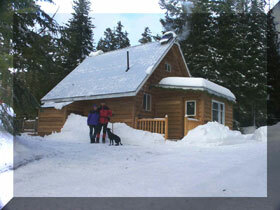 Ice fishing, dog sledding, snowmobiling, cross country skiing, we offer it all in the beautiful BC outdoors. Yes, Star Lake Resort is open in the winter. What a winter wonderland. There is always lots to do when the resort is covered in snow. Snowmobile or dogsled right from your cabin door. We now have dog sledding tours leaving from Star Lake. 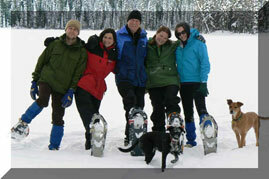 If dog sledding or snowmobiling isn't for you, how about cross country skiing, or snow shoeing. There are simply miles of unused logging roads to explore. Of course don't forget the ice fishing and ice skating on Star Lake. Cabins #1, #3, and #4 are the only cabins we keep open in the winter. They all have wood heaters to keep them warm and cozy. Part of your wilderness experience will be dipping your water from the lake. Water has a nasty habit of freezing in the winter, which effectively eliminates our above ground water system. However you can still use the indoor plumbing facilities. All the appliances, (fridge, stove, and lights), are on propane. Imagine spending an evening, sipping hot chocolate, staying warm around an outside fire, looking up at a clear sky sprinkled with stars, and reminiscing about the day playing in a winter wonderland. Enjoy an Old Fashioned Christmas in a log cabin at Star Lake. Sit around a campfire with hot chocolate watching the stars. Book your winter vacation. Enjoy ice fishing or just relax and enjoy the peace and quiet.